Jewelry fanatics rejoice with a great selection at TrendToGo.com. From necklaces to pendants, from bracelets to sunglasses, from earrings to watches, you're sure to find something that suits your taste. Their sterling silver collection combines cutting edge style with quality and affordability. Save on your next purchase from TrendToGo.com with Trend To Go discounts, Trend To Go promotions, Trend To Go coupons and Trend To Go savings from 58Coupons.com. 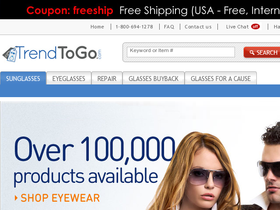 Act now and take advantage of a $10 discount on your order of $50 or more with this coupon code from TrendToGo.com. Use on Wednesdays. Spend $50 or more on TrendToGo.com and you'll qualify for free shipping. Click link now to start shopping. TrendToGo.com is now offering a free pair of silver CZ studs on orders over $100, just pay shipping and handling. Click link to score. Receive a free chain with every pendant you purchase from TrendToGo.com. Click link now.